KIEV, April 11. /TASS/. Ukrainian presidential candidate, comedian Vladimir Zelensky, is way ahead of incumbent head of state Pyotr Poroshenko ahead of the runoff election scheduled for April 21, a recent poll conducted by the Ukrainian Center for Economic and Political Studies revealed on Thursday. 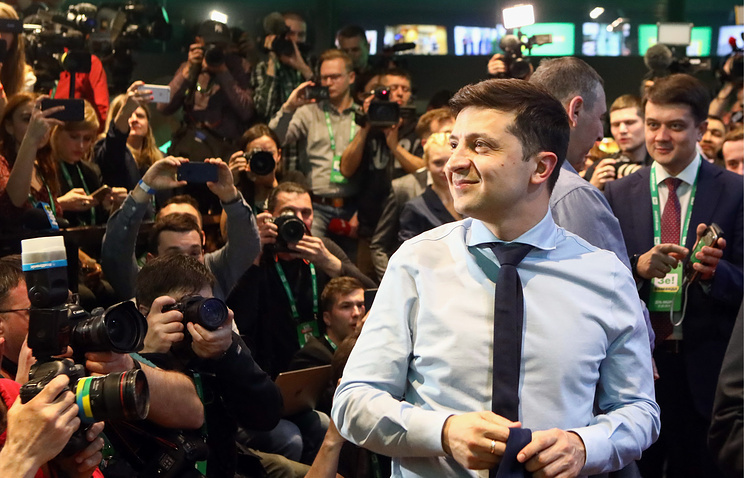 According to the survey, 49.3% of the respondents are ready to vote for Zelensky in the runoff, while 20.6% of those polled said they would be prepared to cast their votes for Poroshenko. As many as 9.7% refused to comment on their preferences, and 20.4% said they were undecided on the issue. According to the outcome of the first round of Ukraine’s presidential eledtion that was held on March 31, Zelensky garnered 30.24% of the vote, while Poroshenko secured 15.95%. The survey was conducted on April 5-9. Its official results are expected to be made public on Thursday. Hey Buddy!, I found this information for you: "Zelensky way ahead of Poroshenko prior to runoff election — poll". Here is the website link: https://russophile.org/zelensky-way-ahead-of-poroshenko-prior-to-runoff-election-poll/. Thank you.